A special 10-channel Weather Band memory bank is provided in the U.S. version, allowing quick access to NOAA weather broadcasts. When the 1050-Hz “Severe Weather” alert tone is transmitted, the FT-2900R may be configured to emit an alarm tone to get your attention quickly. With the “Weather Alert” feature enabled, the FT-2800M will scan the ten Weather memories, stopping only if the 1050-Hz tone is received. I bought this radio about 3 months ago to replace my Yaesu FT-60R which had been doing double duty as an HT and a quasi-base station. After much dithering and equivocation I had decided that a mono band 2m mobile unit vs. a dual band 2m/70cm rig best suited my needs and my budget. The first thing that struck me about this radio when I saw it on display at the not so local HRO store in Phx. was the over sized LCD display. Clean and uncluttered with large clearly visible frequency display. The next thing that jumped out at me was the sheer heft of this thing, due primarily to the large heat sink that provides for cooling without the necessity of a fan. This is one solid unit and it looks and feels it. It was easy to set up had it out of the box and on the air ready in less than half an hour. Programming as with many of these newer radios is not entirely intuitive, but with the use of the straightforward and fairly easy to follow manual had the majority of my frequencies programmed in and ready to go in about 15 minutes. The controls on this unit are tight and feel good to the hand. Separate volume and squelch controls and an over sized frequency selector as major pluses in my book. The audio quality (RX) is excellent and although I am using this unit as a base station, the audio would more than adequate for most vehicles. Crisp, clear and loud. I have had several positive comments on the transmit audio on this radio as well. I do however have some issues with the microphone. I have large hands and to me the microphone feels too small. Yaesu has put a large number of sensitive controls in a relatively small space to facilitate accessibility from the microphone. I occasionally find myself inadvertently pressing something I had not intended to. Other than this one minor gripe , this an excellent unit. Would I buy this radio again? Absolutely! Would I recommend this rig to a friend? Without hesitation! for Indonesia RX/TX 136Mhz - 174Mhz. Good Perfomance BUT..for mic audio highly treeble ond midle. This was my first rig and this thing is built like a tank! I truly believe I could run my truck over it (8,000lbs) without hurting it. Crisp and clean audio that you can actually hear over t sound of my diesel with the windows open, plenty of memory storage, excellent power and a host of great features make this a great "first 2m rig" for any ham. Estimating the value of a rig can be challenging. 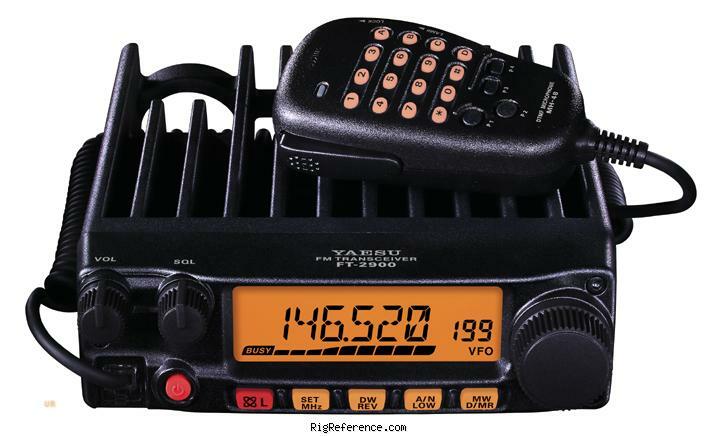 We collect prices paid by real hams over the years to help you estimate the current value of the Yaesu FT-2900R. Just bought or sold this model? Let us know what you traded it for and help other ham operators!